The Scarlettes felt right at home with some of Vancouver’s biggest a cappella fans when we had the privilege of attending an advance screening of Pitch Perfect 2 last Wednesday! Not only was the film entertaining but the a cappella enthusiasm reminded us that our city is pretty spectacular. 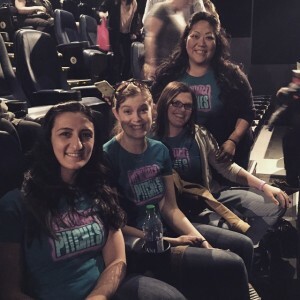 The Scarlettes also got to chat with Pitch Perfect 2 producer Jonathan Shore who was very happy to show us pictures of him at the Los Angeles premiere with the Green Bay Packers who make a cameo appearance in the film. Thank you Vancouver Television for the premiere tickets! We felt quite at home with the crowd. Rehearsals for our spring show are now in full force. It is been a pleasure working with The Squares Barbershop Quartet and, without giving too much away, our fans should expect a musically diverse performance on May 29th! Instruments, 6 part male/female harmonies and perhaps some choral-ography? You will have to come to our show to find out! We have some very fun new music that the Scarlettes can’t wait to showcase at the show. We also have some spectacular joint pieces to be performed with The Squares. There is truly something for everyone. Make sure you come to the show and bring your friends and family for an entertaining (and cheap) Friday night date. Make sure you get your tickets soon – May 29th is approaching fast. The Squares rarely do self-presented shows so we are delighted that they are collaborating with us. Looking forward to seeing you all at St. James Hall on May 29th!